These Halloween Costumes Are Out of This World! Space.com staff celebrated Halloween at the office. Staff writer Sarah Lewin dressed up as Tabby's Star, the possible "alien megastructure." 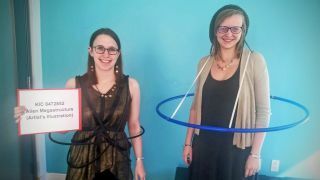 Staff writer/producer Hanneke Weitering dressed up as Saturn, the hula hooping champion of the solar system. NASA has asked the Internet to submit photos of space-themed Halloween costumes on social media using the hashtag #NASACostume. From astronauts to rockets, planets and satellites, here are some of the most amazing cosmic costumes we've seen.